On Sunday 21st August, 2016 Oliver and Sarah Frampton will bring their daughter Willow Jane Winifred to be dedicated to the Lord, supported by Lea and Scott as Godparents. As a church, we join together to send our love to the whole family. On the Lawn – in the sunshine! On Sunday 7th August we shared a special Covenant Service on the church lawn with friends from Verwood and Woodlands Methodist Churches. This service was special because it marked the anniversary of the first Covenant Service organised by John Wesley on Wednesday 11th August, 1775. 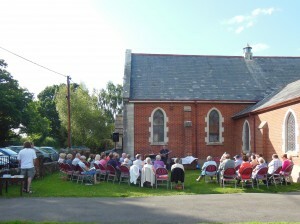 Here we are in the sunshine enjoying some music just before the service began – can you spot yourself? Meet you on the Lawn! It was on Monday 11th August, 1775 that John Wesley, founder of the Methodist Church, held the first Covenant Service at the French Church in Spitalfields, East London – with a congregation of 1,800! On 7th August, 2016 at 6.00 we’ll mark the anniversary with a special covenant service on the lawn at Holtwood, to be led by Revd Nigel Deller with music by Becky Shears and Peter Aston. This will be a united service for the Methodist Churches at Holtwood, Verwood, Witchampton and Woodlands and our Anglican friends have also been invited – and so are you! Why not come along at 5.00 for tea & biscuits beforehand? Although probably even the wonderful Holtwood catering team couldn’t cope with 1,800 for tea! Come along to our united celebration with local anglicans. 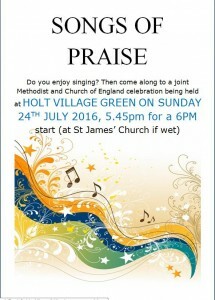 Meet up on Holt Village Green at 5.45, share a refreshing drink and begin singing at 6.00. The evening will be led by Revd Suzie Allen and Revd Nigel Deller with music led by HMB. Hope you can make it! On Sunday 24th July at 6.00 we’ll join with our local Anglican friends for an evening of favourite hymns and songs on Holt Village Green – or at Holtwood if wet. The music will be led by HMB.